Comm Eye Health Vol. 13 No. 34 2000 pp 24 - 25. Published online 01 June 2000. In Bangladesh cataract is probably responsible for over 60% of blindness, but more precise data will shortly be available as a result of a national survey. A cataract surgical rate of at least 2000 cataract operations1 / year / million population is needed to control cataract blindness effectively. However, the present performance is estimated to be less than 500 per annum.2 With a population of 130 million (which is growing at the rate of 2.1%/year), a minimum of 260,000 cataract operations / year are needed in Bangladesh. Comprehensive eye care, which links activities in the community with primary eye care and tertiary services (Modular Eye Care). Most eye care services, which are concentrated in urban areas, are clinically orientated and provide curative services. The majority do not have regular outreach activities, nor do they undertake any preventive work. There are approximately 400 qualified ophthalmologists in the country, and a further 700 who have been trained in ophthalmology, but the level of service provision is inadequate to meet the need, mainly due to maldistribution of resources. Comprehensive eye care services, which encompasses prevention, health promotion, rehabilitation as well as curative, clinical services are mostly unavailable. 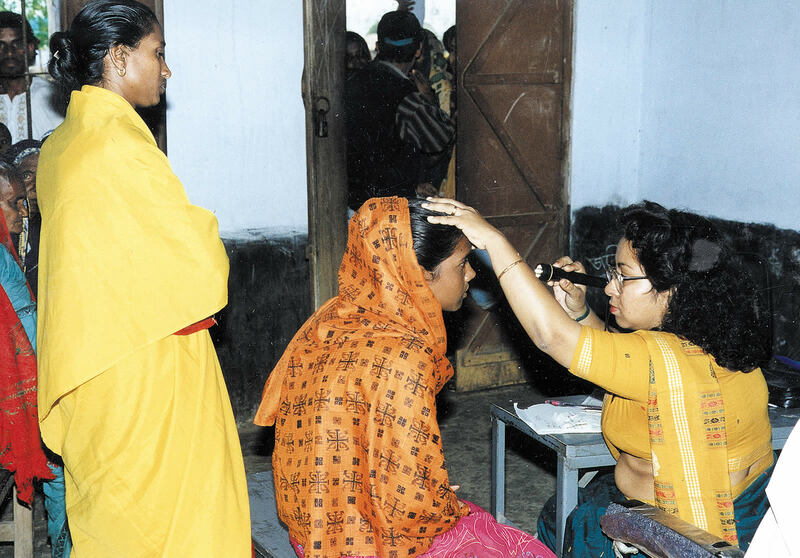 Surgical eye camps are very popular with Bangladeshi people, because the services are usually provided free. However, eye camps are undertaken less frequently now, due to advances in surgical techniques, and awareness of the need for high quality surgery and good post operative follow up. In addition, there are questions of social equity and justice to be considered. 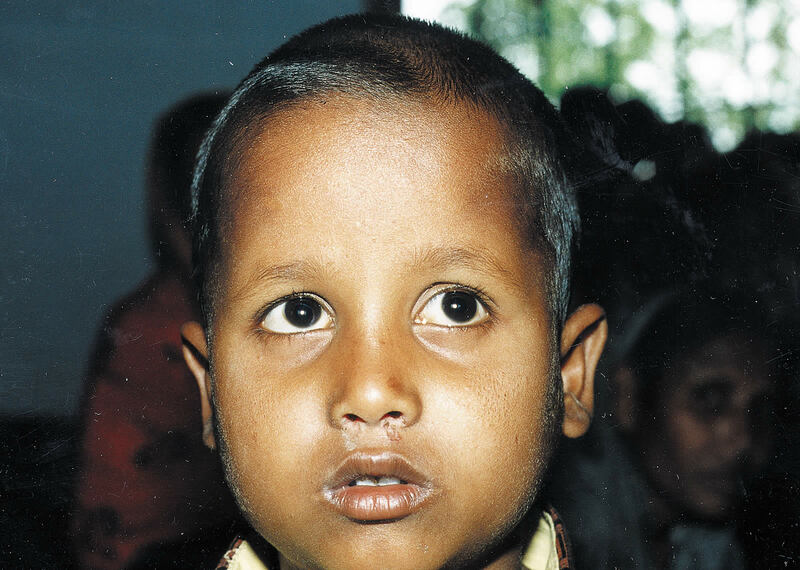 Between 1994 and the end of 1999 the model of Modular Eye Care (MEC) was developed in several districts in Bangladesh. These programmes were supported by Sight Savers International, and they provided a comprehensive range of services.3 Recently the model has been modified (see below). The seven base hospitals of the MEC projects provided a range of diagnostic, clinical and surgical services, being equipped to perform high volume ECCE/IOL cataract surgery. Each base hospital, some of which also provided non-ocular medical services, had a network of 4 Primary Eye Care centres (PEC centres). General doctors trained in PEC and refraction worked in the PEC centres with nurses and ‘Organisers’- they treated simple eye conditions, counselled patients, referred those needing treatment for more complex conditions, and followed up patients discharged from the base hospital. The Organisers worked with local community groups, or with ophthalmologists from the base hospital. They identified patients needing surgery at screening camps; they motivated patients for surgery; health education was provided through community groups (such as women attending literacy classes, or attending meetings of micro-credit schemes); and school vision screening and health education was provided in primary schools. For those people who were incurably blind in the catchment area, Community Based Rehabilitation and integrated education, were often provided, by networking with other local agencies. Sustainability – the projects are designed to address the issue of sustainability in terms of concept, technology and process, by encouraging organisational leadership and financial sustainability through cost recovery. MEC projects introduced user charges a few years ago for those who could afford it, while poor patients received free or subsidised care. Internal income generation and external funds from Sight Savers International and other agencies financed the subsidised services. Sight Savers supported activities to enhance partners’ capacity through a range of training initiatives, and by up-grading facilities. By the year 2002, the projects expect to meet 80% of the running costs through the generation of funds internally (i.e. cost sharing). The MEC model evolved over time, and continues to change in the light of experience. The model has recently been revised, as it was found that the PEC centres were difficult to run efficiently and effectively and were not financially sustainable. Another constraint which limited further implementation of the model was that all the base hospitals were in the non-government sector, and there are a limited number of potential partners in the non-government sector in the country. The model described above has now changed, and there are no longer designated PEC centres, as primary eye care is being integrated into the primary health care system of the country. Another change is that the base hospitals are now also within the government sector. This important step developed through participatory planning workshops, emphasising the need to maximise the use of Primary Health Care (PHC) workers in rural health clinics to provide Primary Eye Care. Central to the concept is that Primary Eye Care is an integral part of PHC, which is already being provided in the community. The government can make Primary Eye Care services available throughout the country with only a small additional investment in training and equipment. In this revised model, base hospitals in the government sector will be strengthened so that they can provide clinical services, and they will run outreach programmes for identifying patients needing eye care and surgery, school vision testing and increasing community awareness. Special education and rehabilitation will continue to be provided, by networking with local groups. Primary Eye Care will be provided by personnel in the catchment areas, after training, and the new model will not have established PEC centres as such. The recent national workshop organised by the National Institute of Ophthal- mology has endorsed the concept and strongly recommended the inclusion of PEC in the government’s PHC training programme. Human Resource Development (training of healthcare staff). Training Primary Health Care staff in rural clinics in Primary Eye Care. – Integration of primary eye care into primary health care, which will lead to the prevention of eye diseases and blindness in the community. Consideration has been given to most of the components needed for an eye care programme of high quality, in terms of both medical and programme management. Social equity and justice, which require free or subsidised services for the poor, are sometimes in conflict with financial sustainability objectives of projects, but this model has taken a balanced approach, considering both elements to be essential. 1 Foster A. Sixth General Assembly IAPB. Beijing, China, 1999. 2 National Workshop, National Institute of Ophthalmology, Dhaka, Bangladesh, 1999. 3 Bill S, Gilbert C, Sabur M A. Evaluation report on Modular Eye Care Projects. Sight Savers International, Haywards Heath, West Sussex, UK, 1997.